From AfroStyle Magazine and designer Tarun Tahilian. This was shared from the page of AfroStyle Magazine. Just when I am into weaving and wearing wrist cuffs, along comes this image of forearms covered with them. And, I have always thought that a turban would be the perfect solution to that awkward transition period from dark brown to grey hair. Not just your conventional turban, but multiple layered silks! And imagine multiple silk ribbon necklaces around the model’s neck. Gorgeous! Do a Google Image search for designer Tarun Tahilian and be prepared to melt. I can’t believe my clothes-challenged self is so taken with this. I chose just one of this designer’s pieces to show as I have been working on a 60/2 silk piece that is in a similar teal-y tone. Once the weaving had advanced so far that it was uncomfortable to reach forward and operate the sheds, I needed to roll up the fabric around the front beam. That was when I really had to do something about the lack of long enough sticks for this project. I was already lacking a suitable back beam and now, a roll-up stick. I looked up on the terrace where people who move out of their apartments frequently dump unwanted brooms and mops. I have cut down many of them for loom pieces. The search didn’t turn up anything and so I headed to the market. It’s all of a block and a half from my place to one of the biggest and most chaotic street markets in this city with its interesting sights, sounds and aromas. I am showing this picture of the broom stall that I visited on New Year’s Eve with a table of underwear in the background so I can tell you about a New Year tradition. It is traditional to sell red and yellow underwear at this time of year as wearing red underwear to bring in the new year will attract love to your life. Wearing yellow will bring you money. The markets are full of this in the days leading up to January 1st. There’s wood under the spotted plastic coating on the broom stick. Unfortunately, the melted plastic seam was very rough and would have shredded my silk and so I had to spend quite a lot of time picking it off and then sanding the gnarly wood underneath. Of course, a couple of days later when I was out and about, I ran into a stall selling bare wooden broom sticks that were wonderfully smooth. I bought two of these perfect ones…two out of three ain’t bad. They cost 80 cents each! Someone on Ravelry posed a question to the weaving group about changes in our loom inventories at the end of 2015. With my new extra long sticks, I guess you could say that I added a new loom to mine. A front beam, back beam and roll-up stick for under $4. My collection of sticks and swords and shuttles has out-grown my bedroom and now lives in the living room. It may not be obvious, but there is some kind of order there. I am pleased and relieved that my small sample of 200 ends gave me reliable information for the 2000 ends that I eventually used. I was able to set the width and maintain it rather effortlessly for the entire project. I spent an entire morning trying to ensure that the threads were all evenly spaced before throwing the first shot of weft. It is supposed to be a bandanna/neckerchief sort of thing but you may see me wrapping it about my head turban-style one of these days, if it is big enough. You can see the cloth being worn and looking very blue again. 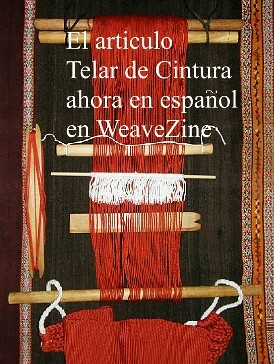 The larger picture, above, shows it fresh off the loom before wet finishing. Now I need to hem it. One of my weaving goals for perhaps the last couple of years has been to go longer, wider and finer. I achieved two out of three with this project and it has been a great way to start the new year. Maybe I will get a three out of three with the next project. Length has never been an issue. I have woven long warps stretched all the way across my room. I have rolled up unwoven warp onto the back beam when there hasn’t been room to stretch out the warp and I have also wound circular warps that have allowed me to halve the amount of space required in which to work. I hope to go a bit longer than my standard lengths in the next project but the biggest challenge will be the sticky fine wool. I want to weave two panels that I will later join into one. I have no product in mind for this piece. The project will be about learning how this wool handles in warp-faced weaving on a backstrap loom. If it works well, I will have something nice to put on a table and perhaps all the information I need to go on and make a poncho. I spent some time watching dvds and listening to music while I rolled the yarn into balls. I had bought lots of it! Then I was ready to wind a sample warp. Hopefully this will give me an idea of the width I will achieve with a certain number of ends in both plain weave and Andean Pebble Weave. I chose a pattern with which I am very familiar as I really wanted to focus my efforts on handling the wool and not on the pick-up. I do have concerns about this yarn breaking over the course of a long piece. It wasn’t taking too well to being constantly rubbed against itself. But, what the heck…I think I will just dive in and try the larger project that I have in mind. You might have to remind me of this ”what the heck” attitude in the next few weeks when I start whining about all the broken warp threads that I have had to fix! Below, you can see the two faces of the band. The width wandered about a bit before settling. Now to figure out colors. Marieke Kranenburg set herself a sewing goal for the holidays and put together various inkle bands and fabric to create this fabulous pillow. Julia T made a backstrap using the intermesh structure and her own pattern. She is pretty pleased to have this lovely cushy s trap now and to be able to leave aside the improvised pillow case backstrap she has been using. 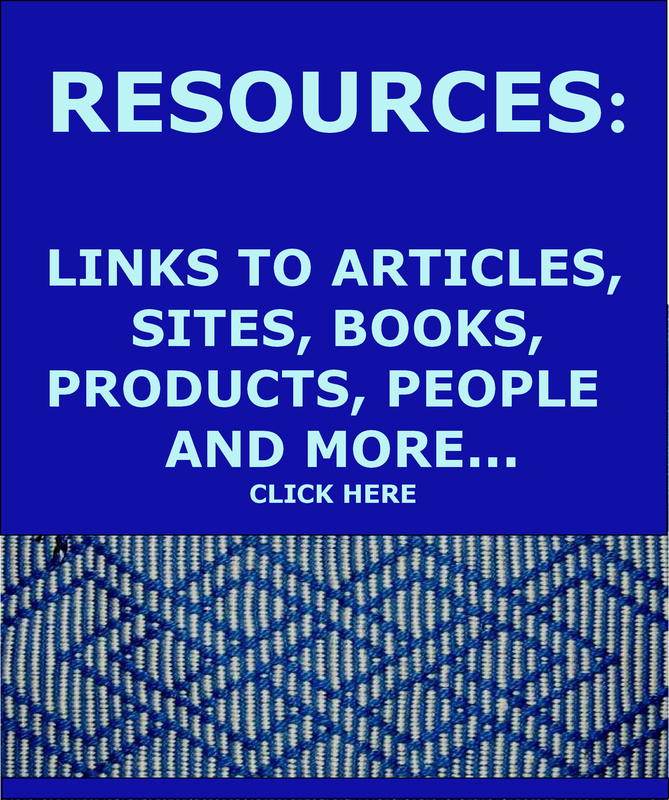 I teach the intermesh structure in my second book. Lori has started making her own backstrap too using the Andean Pebble Weave structure. I wonder if Lily has been weaving at her side. Annamieke’s inkle loom with an Andean Pebble Weave in progress. And, Annamieke Ruijper has been using her inkle loom as a frame for tensioning her Andean Pebble Weave warp. She has woven a series of four-revolution patterns from my book and also included a couple of her own designs. I love that she already has the confidence to do that. 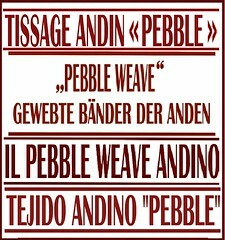 I do not give specific instructions in my book for setting up Andean Pebble Weave on an inkle loom using the loom’s own heddle system. 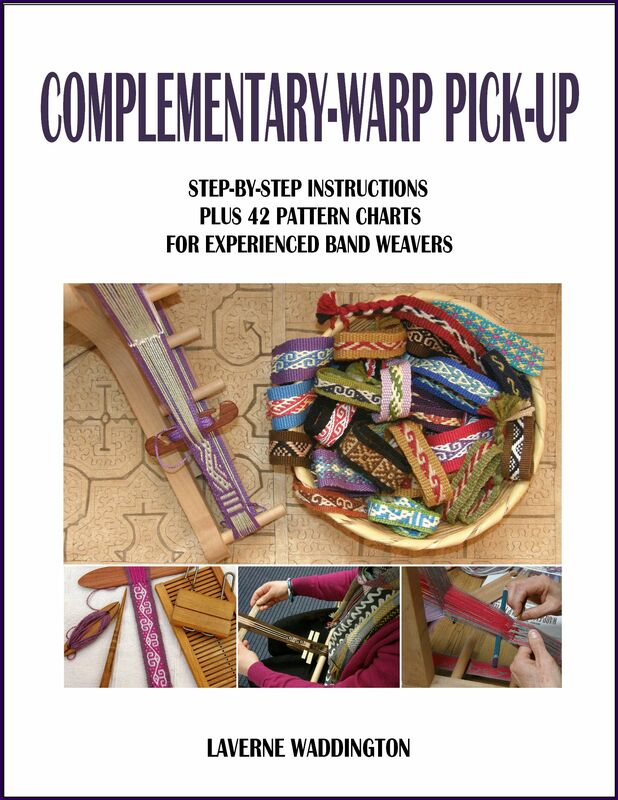 My book shows how to wind a warp and dress it and then you are free to tension it any way you wish…using the frames of inkle, rigid heddle or tapestry looms, for example, or your own body at one end – backstrap-style. There are many possible ways to set this up on an inkle loom and this is just one suggestion. I have done it at least three ways, sometimes using the inkle loom’s heddle system, and sometimes not. Sophie Regny wove this Andean Pebble Weave piece using a pattern in my second book. 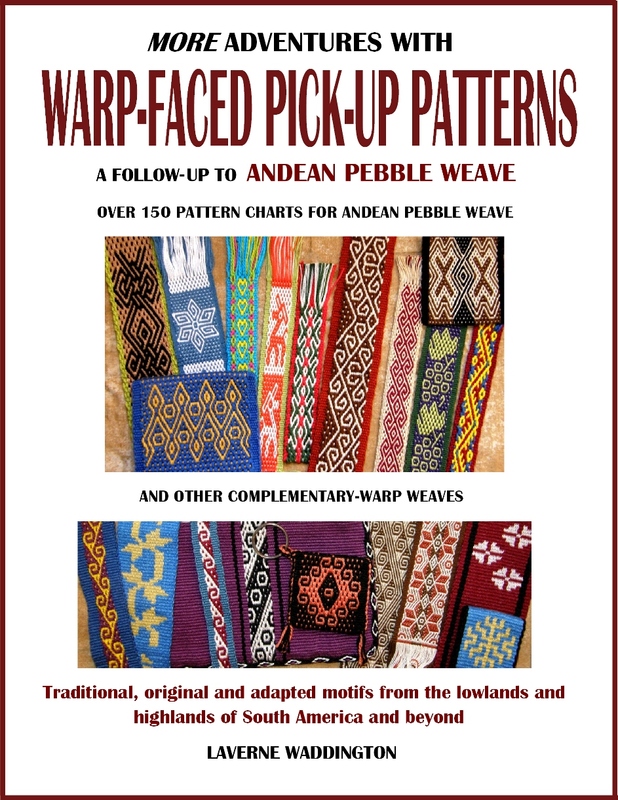 When I was putting that book together, I started seeing potential Andean pebble Weave patterns everywhere. I created this design from the pattern on the inside cover of a journal that I had been given. It’s lovely to see someone using the pattern and Sophie’s work is crisp and neat. Marianne Planting tensions her Andean Pebble Weave bands using a backstrap set-up and a band locking device. Below, you can see her work in progress where she is using one of the patterns I adapted from the tablet weaving of Louise Ström in my second book. Facebook reminded me today that five years ago I was working on the strap for my backstrap loom bag. I had decided to create the word ”weave” in various languages and fonts. I used a weft twining technique to do so. The strap didn’t need to be that long and so I only managed to fit five or six words on it of the many that Facebook and blog friends had given me. Today, when I shared the Facebook Memory, I received some more. I think I need to come up with another project in which I can use all the words I have been given from weaving friends around the world. 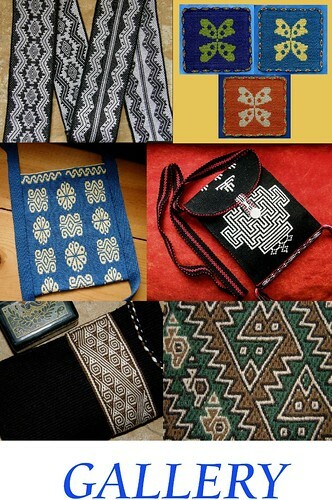 « Backstrap Weaving – Silk, Stitches, Samples and Shed Rods. The teal silk piece is so beautiful! I can’t believe how fine the threads are, and how many of them! It looks gorgeous on you, I bet it feels great too. Thanks, ingrid. Yes, it does feel wonderful….certainly nothing like anything that has come off my loom before. Laverne, your silk cloth is simply gorgeous ! I love colours, the drape, and the shiny texture! I hope reach your ability one day. Thank you for sharing the photo from African magazine, I like it too and thanks to you I have discovered the facebook page of this magazine that contains a lot of very inspiring pictures ! It could help if you place some primary colours in the picture, giving your camera these corner points to force it into better colour choices. One sometimes sees such rainbow swatches on museum photos, but you’ll likely have some yarn around to serve the same purpose. But it looks quite stunning in blue as well. Thank you, Daphne. I will definitely try that. I am glad to finally know what those rainbow swatches are there for. Idea of the cushion inspires me!